During November 26 to December 12, 2011. sessions of research|development workshops are held in London. Modify, remodel and hack for generating revolting noise. 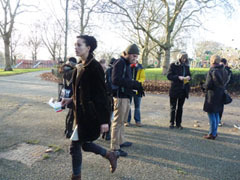 The workshop followed Chiptune marching band's noise electronics DIY scheme and ended with a marching through London Field on a sunny afternoon. 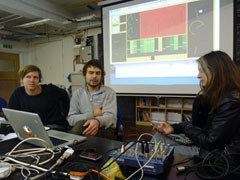 Score, notate and live code with Marc Widmer and Jonas Ohrstrom of [tramjam.net]. These workshops were attended by London PD patchers and Goldsmiths students. A smartphone interface for diapatching 500 slogans with public participation was planned for further development. Join the plotting of the Moving Forest Libretto - read, recite, sing, shout, scream, murmur, memorize and burn the slogans. With Graham Harwood's extended play of the film Throne of Blood projected, sign on participants and walk in museum public took turns to read through the 500 slogans. The saturday afternoon session was joined by writer Matthew Fuller. 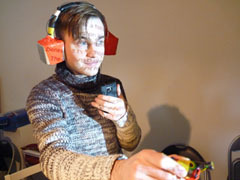 These 3 workshops are thoughtful, playful and schematic with enthusiastic participants.